You see him every day. But you don't know who he is...on the inside. "Dark suspense at its best " ★★★★★ "Suspenseful page-turner that you won't be able to put down. "★★★★★ Among palm trees and swimming pools of California, a new killer hunts. Pursued by rookie cop Jane Laymon and psychologist Trey Campbell, this murderer's pathology may be linked to inmate Michael Scoleri -- AKA Abraxas -- at the Darden State Hospital for Criminal Justice. Do they communicate with their minds?The young man in the straitjacket doesn't want the Red Angel to be caught. But his skin holds the name of an upcoming victim. And up on Moon Lake, in the San Bernardino mountains, a terrifying killer plans to descend into the valley to find his next victim. For fans of James Patterson, Dean Koontz and Thomas Harris. "Douglas Clegg knows exactly what scares us, and he knows how to twist those fears into hair-raising chills..." -- Tess Gerritsen, New York Times Bestselling Author. 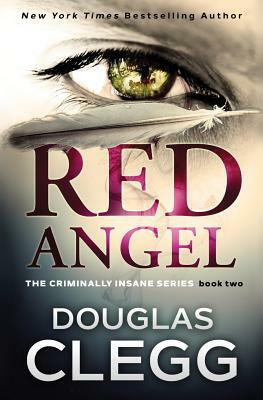 The Criminally Insane Series: Book #1, Bad KarmaBook #2, Red AngelBook #3, Night CageFIC030000FICTION / Thrillers / SuspenseFIC031040FICTION / Thrillers / MedicalFIC025000FICTION / PsychologicalFIC022000FICTION / Mystery & Detective / GeneralFIC015000FICTION / HorrorFIC050000FICTION / Crime.